In any mine, safety must be at the top of the agenda. If there is a fire or a release of toxic gases personnel need easy access to clean air, food and water until a rescue operation is underway. In most mining operations, there is also the potential for irrespirable atmosphere to be generated, due to a fire, outburst of toxic gases, or the concentration of diesel emissions. Access to breathable air is absolutely crucial in these situations and chances of surviving disasters are significantly increased if workers have a place to find immediate refuge, breathable air and a safe place when escape is not safely possible. One company providing this space is Strata Worldwide, a global provider of products, services and technologies that promote a higher level of worker safety in the mining environment. 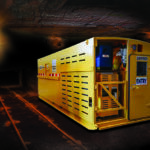 In addition to offering emergency refuge chambers in many shapes and sizes, according to mine and application requirements, a key priority for Strata’s product development was to make them easy to use. “We have gone down an ease of use approach”, Paul Morrish, product manager at Strata explains. Knowing that in a period of crisis or emergency people want operations to be as easy and clear as possible, Strata has considered this in all aspects of its emergency refuge chamber design. “We know that people are stressed and unsettled in an emergency, so we wanted to make our product as uncomplicated as possible. 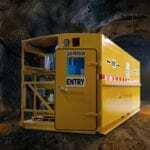 For example, with the Strata chambers you simply hit a big red button and all the lights come on,” Morrish says. Strata has global distribution of its product and it is important to ensure that instructions were clear enough to transcend any language barriers. “We have made all the operations in the chamber as simple as possible, so anyone who needs to operate it can,” Morrish says. Refuge chambers should be found every 750 metres and there is a requirement for monthly, quarterly and yearly checks. As the Strata chambers have been designed to function as simply as possible, many of these checks can be done in-house by trained personnel. “We train people and qualify them to do the quarterly and monthly inspections,” Morrish says. After a chamber is ordered from Strata a member of the team will provide onsite safety and maintenance training. “We ensure that all of the operating functionality of the chamber is easy to use, this means we don’t spend hours with onsite training. It takes us 30 minutes to demonstrate and train staff on how the chamber works and then they are on their way,” Morrish says. According to Morrish, this saves people time and gives them confidence if they need to use the chamber. Another advanced design feature of Strata’s offering is the battery. As the chamber has to be able to function for 36 hours in the case of a possible power cut, it must have a battery that can power the entire unit. “The big cost and inconvenience with chambers is often the battery,” Morrish says. Often design specification put the battery at the back of the chamber, where there is no airflow. With the Strata product the battery is at the front of the chamber; this allows for a much cooler environment. In addition, the Strata design has a fully removable battery box. They are bundled in convenient, portable packs to optimise handling and transportation. According to Paul this allows for easy access and any manual handling can be done in a controlled environment. The battery is stored on a convenient pull-out shelf which enhances access and simplifies maintenance. 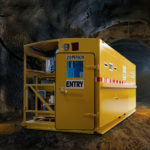 Strata Worldwide has invested time and resources to fully understand the needs of the mining industry and has developed a series of emergency refuge chambers that are simple and easy to use in a moment of crisis. The team at Strata provide training and support so that site managers can rest assured that their mining personnel will be kept safe in an emergency.